October 1943. A US Navy warship vanishes at sea off the coast of Philadelphia. Its disappearance was rumoured to have been a result of a classified military experiment into the effects of electromagnetic radiation. The story has long since been considered a hoax. But Juan Cabrillo and his colleagues aboard the top-secret spy ship Oregon aren't convinced. Now, a powerful new weapon is for sale - one linked to genius inventor Nikola Telsa, who was working with the Navy when he died in 1943. Was he responsible for the original Philadelphia experiment? Are his notes in the hands of his enemies? As Cabrillo and his crew race to unearth the truth they discover that stakes are dangerously high. And it may already be too late . 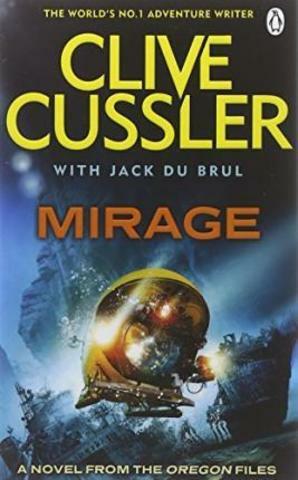 . .
Offering an irresistible combination of breakneck pace and audacious plotting that Clive Cussler has made his own, Mirage is state-of-the-art action-adventure. The ninth title in the Oregon Files series, it is preceded by The Jungle and The Silent Sea.